On Sept. 11, 2001, a man was killed in New York City. He followed the wrong directions to a new job, ended up in a bad neighborhood and was shot in the head. Police were stretched too thin to investigate properly, and the case remains unsolved. In 2012, a man in Brooklyn killed his lifelong neighbor for no apparent reason other than a 13-year-old argument over a slice of pizza. In 2015, a man filed a suit against a Manhattan psychic for grand larceny. He had paid her $713,975 over time to be reunited with an old flame. Surprising things happen every day in New York City. But nothing captures the imagination like true crime. For the past six years, Michael Wilson, a graduate of Loyola University New Orleans, brought readers stories of the unnerving, the outrageous and the odd in his column Crime Scene in The New York Times. The column was retired on Saturday, March 25, but Wilson will continue bringing stories to life at The Times. 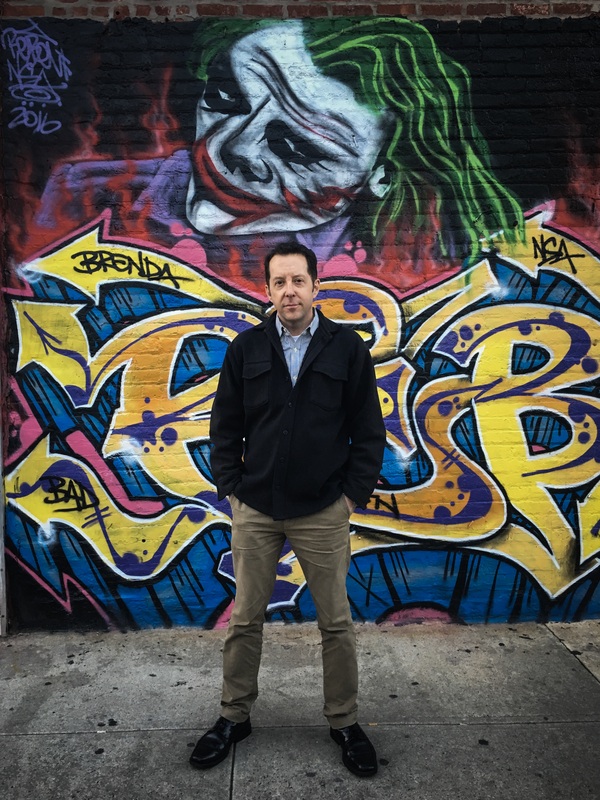 For the past six years, Michael Wilson, a graduate of Loyola University New Orleans, brought readers stories of the unnerving, the outrageous and the odd in his column Crime Scene in The New York Times. Michael Wilson lives in Brooklyn with his wife, Kinda Serafi (both Jesuit school alums), and their two sons, Jude, 7, and Gabriel, 4. He has been writing for The New York Times for the past 15 years, and he visited America’s offices to talk about his career as a new chapter begins. Wilson got an early start in journalism, working a paper route in his childhood home of Buffalo, N.Y. His family moved to Tallahassee, Fla., for his high school years, and Wilson’s father, a graduate of Canisius College, suggested his son apply to Jesuit universities in the southeast. Loyola New Orleans caught Wilson’s attention, and there he became the editor of Loyola’s student newspaper, The Maroon, and studied under America’s books editor, Raymond A. Schroth, S.J. Before landing his first job as a reporter, Wilson sent out résumés to over 50 newspapers across the Southeast. “I just got reams of rejection letters—‘No thanks,’ ‘We’re not hiring’—very discouraging.” He eventually got a job reporting for The Montgomery Advertiser and was put on the public education beat—which would not have been his first choice. Over the years—which included stints reporting in Mobile, Ala., and Portland, Ore.—Wilson developed a talent for picking out the eye-catching details that others might overlook. It is a skill that has served him well during his 15 years with The New York Times. Wilson developed a talent for picking out the eye-catching details that others might overlook. One of his earliest assignments with The Times was in Iraq as an embedded reporter with the U.S. Marine Corps in the spring of 2003. “That wouldn’t be something I would have volunteered for, but I wasn’t going to say no,” he recalled. “And next thing I know I’m in a Jeep surrounded by tanks and rolling into Iraq with this Marine unit.” There, he wrote feature pieces profiling some of the men he met and sharing firsthand accounts of battles. After his assignment in Iraq, Wilson covered various events around New York in addition to crime. He was one of the first reporters to the scene when Capt. Chelsey Sullenberger landed his airliner on the Hudson River, and he wrote about the troubles of New Yorkers as the city recovered from Hurricane Sandy. 'To me, it’s maybe the most important part of the entire story,' Wilson says of a story’s first few lines. Wilson’s column, which ran weekly, was originally devised by Carolyn Ryan, currently an assistant editor at The Times. Marked by strong ledes and memorable last lines, Wilson’s writing engages readers and leaves them pondering a unique aspect of life in New York City. From a brawl at the New York Athletic Club to the daily theft of beer at the Duane Reade in the Port Authority Bus Terminal, Crime Scene brought to light a striking spectrum of criminal activity. A selfie of Wilson reporting a column on turf wars between ice cream truck drivers. Wilson’s stories demonstrate a passion for storytelling, with characters conveying important bits of information to put the reader in the story, as if they were the ones interviewing a victim’s aunt or visiting the home of an accused man’s father. When Wilson recalls his stories years later, it’s the particulars that stand out to him. For example, when working on a story about the heroin epidemic sweeping Staten Island, Wilson learned of a man who died of a drug overdose in the bathroom of the Red Robin at the Staten Island Mall. When Wilson sat down with the deceased man’s family, his mother told him about her trip to the florist to buy flowers for her son’s funeral service: “She saw a heart-shaped arrangement—it’s called a broken heart arrangement, because it’s all white and there’s a jagged line of red roses through the middle of it,” Wilson recalled. The arrangement had been made for another family who had lost a son to overdose. “I thought, what an interesting entrée into this epidemic: The impact on the funeral and florist industries,” remembered Wilson. After six years of diligently writing Crime Scene, Wilson is moving on to focus on longer, more in-depth projects at The Times, but he is grateful for the time he has spent with his column. Teresa Donnellan is a Joseph A. O’Hare, S.J., fellow at America.